Check out our unbeatable prices by clicking on the Hotel Deco Online Booking Office. We are pleased to announce that our fantastic location is matched by the outstanding quality of the rooms and services on offer at the 2 star budget Florence Hotel Deco. Hotel Deco offers sigle, twn/double and triple rooms furnished in the Florentine neoclassic style. The rooms in this budget hotel in the centre of Florence are equipped with internal private bathroom, hairdryer and TV. Airy, comfortable, charming and intimate, the rooms on offer at the 2 star Hotel Deco in the heart of Florence provide those of you who are travelling on a shoestring budget with the value for money accommodation that you have been looking for. Include single bed, air conditioning and heating, telephone and hairdryer. Rooms with queen size or 2 single beds, plus a third added bed. Air conditioning and heating, telephone and hairdryer. The Hotel Deco Florence complements its great central location with a range of services not often found in the 2 star category. Our staff will provide you with the inside track on what to avoid, the best value restaurants, the nightlife hotspots and most sought after attractions in Florence. 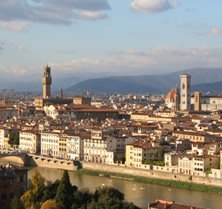 Room with queen size or 2 single beds and furnished in Florentine style. Included are air conditioning and heating, telephone and hairdryer. Our team at the reception is open 24 hours a day and at your every disposal to help plan out your itinerary on exploring the sights of the city best suited for you. It’s our special pleasure to help you choose among the vast selection of restaurants the city have to offer, from small trattoria type places to high class fine dining. Tuscany is rich with cities, small towns and suburbs of great historical and artistic significance. Places such as Siena, San Gimignano, the whole area of Chianti, where it’s possible to taste the famous wine know all over the world, Pisa, Lucca, and Volterra. We can book organized tours to discover our region or help you create tailor made itineraries with the use of a hired car with a driver and authorized guides. This budget Florence hotel offerss an excellent central location, low rates, lovely rooms and expert quality service providing the possibility inclusion of a buffet breakfast, booking tours, museums and restaurants. The hotel is located in the historical centre of Florence and the building is hundreds of years old, as a consequence there is no lift /elevator! Reception is located on the second floor. However there are only 4 floors as it is not a tall building. For those guests arriving by car we have an agreement with a small garage nearby… a daily supplement applies for this service.